For any organization change is the only constant and the change can come from any direction. It could be due to stakeholder expectations, organizational structure, environment, policies and procedure, product evolution etc. In this ever evolving environment, digital transformation plays an extremely important role to create an engaged and productive workspace. The biggest challenge for any company today is to reach a dispersed and diverse workforce and help them communicate better. This is where ASK can play a huge role in engaging with your entire workforce to establish a more targeted and personalized communication. This will also allow your workforce to believe that they can get accurate information in their own backyard which will, in turn, stop them from relying on outside sources. A McKinsey and IDE report determines that enterprise collaboration can improve productivity by an average of 30% if finding the right information from the right people can be made faster and easier which, in turn, will aid in making decisions faster. 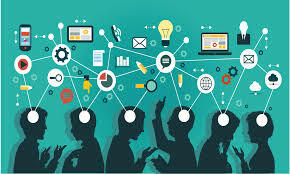 By connecting information, ideas and people on a single platform ASK enables frictionless collaboration.If you can implement this successfully in your organization, you will find that you have created an interactive community that drives innovation. McKinsey estimates that knowledge workers spend 20 percent of their work week looking for internal information or in finding that colleague who can help with the task at hand. This does not just translate to them squandering time trying to find information but they are also wasting around $900 billion to $1.3 trillion annually. Hence, modern technology that brings about knowledge discovery and preservation is indispensable. Here, again, ASK can be of great help by serving as a gateway to your most valuable assets – knowledge and people. By allowing free flow of ideas, suggestions and information, you can capture who knows what, and thereby, allow your employees to find the right information. The ASK feature of Wizergos propagates true digital transformation by empowering your employees to not just communicate and collaborate better but also enables them to find the right experts or content they need so that they can get work done rather than sifting through emails or files. This ultimately leads to better engagement and alignment of your dispersed and diverse workforce.